Work is about to start to reduce flood risk in Ponteland, Newcastle. 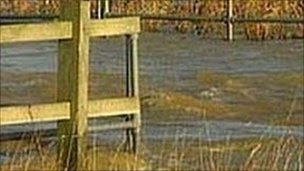 The Environment Agency is improving some of the town's flood defences for protection from the River Pont. It said the town's lowest defences were at Waitrose car park, putting 46 properties at risk. The agency will start work to increase the height of two flood walls in the town centre, raising the height of the flood bank in the park and boosting the height of the supermarket ramp. Work on the flood walls and in the park will start on Monday and is expected to take about eight weeks to complete. Work to raise the supermarket ramp will start early in the summer. However a new computer modelling has shown that the existing defences in Ponteland provide a greater standard of protection than previously thought. The agency said that once the work has been completed about 480 homes and businesses in Ponteland would be at reduced risk from a flood with a 1% (or 1 in 100) chance of it happening in any given year. Ben McCarthy, from the Environment Agency's flood risk mapping and data team, said: "The results of our study also highlighted the importance of maintaining the river channel. "Thick vegetation in the river channel slows down the flow of flood water and can lead to higher water levels against the town centre flood defences." The River Pont last flooded Ponteland in November 2000, when heavy rainfall caused extensive surface water flooding and the town's main flood defences were overtopped, in combination affecting 147 properties. The town was flooded again in 2008 when surface water flooded 19 properties.